The item Debits and credits for zombies, The Foolproof, Fun and Easy Way to Learn Debits and Credits, Ross Bloore, (electronic resource) represents a specific, individual, material embodiment of a distinct intellectual or artistic creation found in Richland Library. At last, for everyone who has been turned into a zombie by studying Accounting, a book that makes learning Debits and Credits foolproof, fun and easy. Debits and Credits For Zombies is fun, really easy to read, and contains a simple, easy to follow method that takes all the mystery out of Debits and Credits. Plus, as if all that isn't enough, Debits and Credits For Zombies is short, cheap, and is the only Accounting book ever to feature bagpipes and a weasel. Every year millions of people try to learn Accounting. And every year the experience turns most of them into zombies. They feel half dead. Like they've lost the will to live. And the worst part is almost always Debits and Credits. If this is you, don't despair. There is a cure. 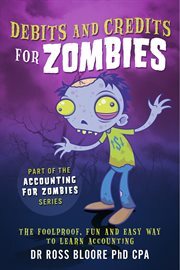 Being part of the Accounting For Zombies series, this book makes learning Debits and Credits foolproof, fun and easy. It contains a proven method developed over many years teaching Accounting to thousands of students, business people and Company Directors. Follow the method and you will learn Debits and Credits. And, just as important, get your life back!